The blue and pink hues take over the sky at sunset as evening closes in around the area of Green Point in Gros Morne National Park in Newfoundland, Canada. 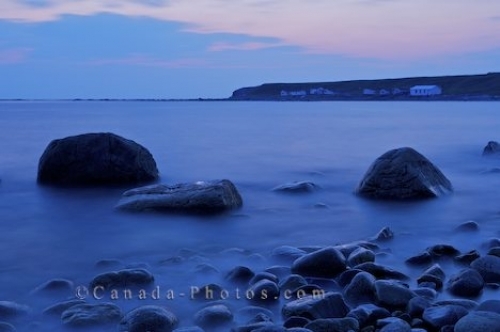 The rocks jut out of the water at Green Point in Gros Morne National Park in Newfoundland, Canada as the soft colored light at sunset sparkles off the surface of the water and the large boulders. Evening is a peaceful time of day around Green Point and the best time to pick a spot along the beach and watch the sun disappear across the horizon leaving behind its beautiful colors. Picture of a sunset as the evening light begins to take over, as seen from the beach at Green Point in Newfoundland, Canada.